Myrtle (Thurston) McVay was born on April 12, 1877 in Bridgeport near Mt. Pleasant, Westmoreland County, PA, the daughter of Charles and Emma (Minerd) Thurston. On Sept. 14, 1899, when she was age 22, Myrtle married 24-year-old James Ira McVay (1875-1926), seen here. He was the son of John and Rebecca (Baggs) McVay of West Newton, Westmoreland County. Justice of the peace L.S. Rhoades of Westmoreland County performed the nuptials. The McVays had two sons -- Richard Alvin McVay and John David McVay. Sadly, son John died at childbirth, in about 1911 or 1912, and was buried on a neighbor's farm in an unmarked grave. James originally enlisted in the 10th Pennsylvania on June 10, 1891, when he was age 16, and re-upped on April 12, 1906, as a machinist, when he was age 31 and living at Stauffers, near Mt. Pleasant. The federal census of 1910 shows the newlyweds making their home in Hempfield Township, Westmoreland County, near Greensburg. James' occupation is listed as "engineer - coal mine." 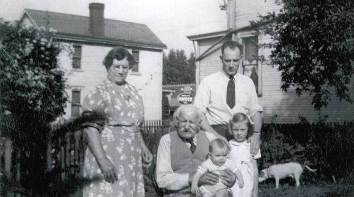 Myrtle, left, with her aged father Charles Thurston, seated, grandchildren Jack and Arminta "Grace" and son Richard, in a four-generation photograph. In 1919, they lived in the coal mining town of Millwood, Westmoreland County, where a major shaft had been sunk and a town built around it. James worked as a pumper in the mine. The family made its home by 1925 at Superior, Derry Township, Westmoreland County. That fall, James ran for the elected office of tax collector of Derry Township, as a Republican, but was sent to defeat in the polls. As a veteran of the Spanish-American War, James became eligible for a military pension based on his service. In June 1926, his monthly pension award was increased from $12 to $20. Upon hearing the news, he told relatives that he planned to purchase additional life insurance. By the summer of 1926, James had secured employment as an automobile mechanic with the Overland dealership in Latrobe, located at City Parking Place and owned by I.W. Altman. 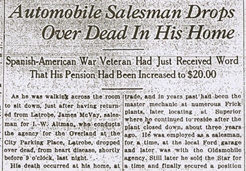 That year, the Latrobe Bulletin said that James "was a mechanic, by trade, and in years past had been the master mechanic at numerous Frick plants, alter locating at Superior where he continued to reside after the plant closed down, about three years ago. He was employed as a salesman, for a time, at the local Ford garage and later was with the Oldsmobile agency. Still later he sold the Star for a time and finally secured a position with the Overland agency." ...was walking across the room to sit down, just after having returned from Latrobe.... He had seemed in his accustomed health, yesterday, and had worked throughout the day. He remained at the parking place until after eight o'clock, late evening, and shortly before leaving for his home, he had fixed a tire on his car. 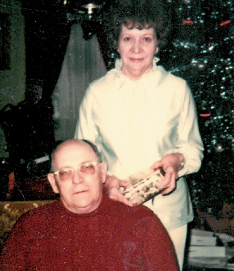 Upon arriving at his home he remarked to Mrs. McVay that he wasn't feeling well, and she told him to sit down, and she would get him something. He was in the act of crossing the floor when he dropped over dead. He was laid to rest in the cemetery across from the Middle Presbyterian Church ("Middle Churches") near Mt. Pleasant. Widowed at age 48, Myrtle resided in Mt. Pleasant with her son and elderly father. In 1931, in September, she and Richard attended a 25th wedding anniversary reception for her brother Alvin. During World War II, Myrtle made her home at 157 Diamond Street in Mt. Pleasant. She and all families were restricted on what they were allowed to purchase, and were issued ration books. In early May 1942, while at the Ramsay High School registering for rationed sugar goods, she suffered a stroke. Sadly, she only lived one day, and passed away at the age of 65 on May 7, 1942 in Frick Memorial Hospital. Her funeral was held at the Methodist church in Mt. Pleasant. She rests for eternity beside her husband. Son Richard Alvin McVay (1914-1993) was born on Oct. 28, 1914 in Westmoreland County. For all intents and purposes, with the death of his baby brother, he grew up as an only child. They each told their parents they were going to a friend's house to stay the night. My grandmother said on their way to West Virginia, there was a snow storm and a few times their car spun around. They got married and then went back to their homes. Around April 1934, Richard's mother was putting some clothes away and found the marriage license. She asked him about it and he admitted they got married. They then went to Wilma's house and told her father. He was not happy about the elopement. From there they moved out of their parents' homes and moved in together. Wilma's dad wanted her to go to college, not get married so young, which wasn't typical for their day and age. Wilma was born on Nov. 8, 1914, the daughter of John G. and Minnie Grace (Hays) Ferguson. They went on to have five children -- Arminta "Grace" Fmura Kerchner, John Richard "Jack" McVay, Patricia Ann McVay, James Dean "Jim" McVay and Michael Alvin McVay. They also raised a grandson, Ira John "Ike" Fmura. The McVays were affiliated with St. Mark's Lutheran Church of New Stanton. Some of their family baptism records are preserved in a light-blue booklet compiled by Paul Miller Ruff, entitled St. Mark's Lutheran Church (Mechling Bookbindery), covering the years 1906-1947. Richard's distant cousins James "Stanley" Hower and John Minard Trout Sr. and their families also were members of the church. Richard was employed for many years as a railroad locomotive engineer, and they made their home in Youngwood, Westmoreland County. Following his retirement, he became involved with many community volunteerism initiatives, among them the Youngwood Volunteer Fire Department, American Red Cross (where he donated blood) and Meals on Wheels (delivering meals to shut-ins). He also provided shopping services for shut-ins. At one point he saved the life of a young boy, Ricky Bricker, son of Richard and Bernadette Bricker of Tarrs, Westmoreland County. Wilma also was active in the community. Said the Greensburg Tribune-Review, "She was the past president of the Ladies Auxiliary of Youngwood Fire company, a former leader of Youngwood Dieters Club, secretary of Youngwood High School alumni Association and volunteer for the Red Cross for many years." Wilma passed away at home at the age of 89 on Jan. 5, 2004. Following a funeral held at the Harrold Zion Lutheran Church, led by Rev. Robert A. Free, she was laid to rest in the Westmoreland County Memorial Park. At the time of her passing, said the Tribune-Review, she was survived by 12 grandchildren, 14 great-grandchildren and three great-great grandchildren. Granddaughter Evelyn Sue Fmura (1954-living) was born on Nov. 8, 1954 in Oklahoma. She was wedded to Martin Gismondi ( ? - ? ), son of Helen Gismondi and resided in Mount Pleasant. They had one son, Martin Patrick Gismondi II. Grandson Ira John "Ike" Fmura (1956-living) was born on July 14, 1956. He was united in marriage with Elizabeth Curry (957 - ). They reside in or near Miamisburg, OH, and their son is Michael Ira Fmura. Granddaughter Heather Joyce Kerchner (1958-living) was born on Nov. 23, 1958. She married Lawrence Robert Leggett (1953-2001). He was a native of Elizabeth, NJ and the son of Charles H. and Anne (Fish) Leggett. They resided in Youngwood and had four children -- Jeremy Lee Shawley, Terri Heather Shawley Hassinger, Jonathan Ira Leggett and Jacob Lawrence Leggett. A graduate of Penn State University, Larry served as superintendent of sports for Hempfield Township. Said the Greensburg Tribune-Review, he was certified by FIFA and the Pennsylvania Interscholastic Athletic Association (PIAA) to officiate soccer matches, was a coordinator for Hempfield Township's Top Soccer Program and a past member of the New Stanton Fire Department. They attended St. Luke's Lutheran Church in Youngwood. Sadly, Lawrence died at home at the age of 48 on Dec. 9, 2001. Rev. Theodore Bessey officiated at the funeral held at the family church. Heather is now married to Tommy Neal. Grandson Richard Kim Kerchner (1959-living) was born on Oct. 31, 1959. He resides in Greensburg and has five sons. They are Jason Lee Kerchner, Alex Kerchner, Richard Duane Kerchner, Matthew Kerchner and Zachary Kerchner. Son John Richard "Jack" McVay (1940-1962) was born in 1940. At the age of four, in May 1944, he underwent throat surgery in Frick Memorial Hospital. He died of a brain aneurysm when he was age 22, in January 1962. Daughter Patricia Ann McVay (1943-living) was born on Oct. 1, 1943 in New Stanton. When she was six years of age, she and her brother James both underwent throat surgery in Frick Memorial Hospital, with the news reported in the gossip columns of the Connellsville Daily Courier. She resides in Youngwood and has two daughters -- Amy Ann Busch and Tamara "Tammy" Lee Whitehead Hodder. Granddaughter Amy Ann McVay (1967-living) was a May Day baby in 1967, born in Greensburg. She married Regis P. Busch (1968-living) on Oct. 24, 2014 at Harold’s Zion Lutheran Church, Greensburg. Granddaughter Tamara Lee "Tammy" Whitehead Hodder (1970-living) was born on April 24, 1970 in Greensburg. She married Ralph P. Hodder III (1970 - ) on Aug. 3, 2001 at Harold’s Zion Lutheran Church, Greensburg. 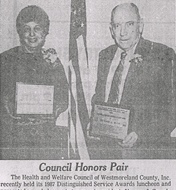 Ralph’s parents are Ralph P. Geraldine (Elliott) Hodder Jr. of Harrison City, Westmoreland County. They have two children. Ralph P. Hodder IV, born in St. Mary’s, PA and Shannon Alaina Hodder, born in Jeannette, PA. Tammy is employed as a legal assistant with the firm of R. Thomas Murphy & Associates, P.C., of Waynesboro and Chambersburg, PA. Son James Dean McVay (1946-1992) was born on Sept. 24, 1946. At the age of 22, on May 17, 1969, he was married to Pamela A. Kuszaj ( ? - ? ) and had three children -- Christine Marie Weller, Kelley Lynn McVay and James Patrick McVay. Later, he was remarried to Jung Suk Kim McVay and had one more offspring, Su Jahn McVay. He died on Feb. 12, 1992 of lung cancer. Burial is in Plum Creek Cemetery in Plum Borough near Pittsburgh. Granddaughter Christine Marie McVay (1970-living) was born on June 29, 1970. She was united in wedlock with Ronald Weller. They have one son, Nevin Weller. Granddaughter Kelley Lynn McVay (1971-living) was born on September 11, 1971. She is not married. Grandson James Patrick McVay (1974-living ) was born on New Year's Eve 1974. He married Bobbie Jo Morrison. They have three children: Allison, Michael and Katherine. Granddaughter Su Jahn McVay (1989-living) was born on May 12, 1989. Son Michael Alvin McVay (1953-living) was born on Sept. 12, 1953 in Mount Pleasant. On Dec. 17, 1977, at the age of 24, he married Doris Hammond of Jacobsburg, OH. They reside in Avon Lake, OH and have two daughters, Nicole Lanigan and Jessica Kershner. He serves as senior vice president of content and programming for Cumulus Media and Westwood One Radio Networks. In this role, he oversees the programming of nearly 500 radio stations and two radio networks, including Westwood One. A 40-year programmer with consulting, management, ownership, sales, programming and on-air experience, he has developed and launched several nationally syndicated programs. He also has programmed around the world with more than 300 stations to his credit. Stations programmed or consulted include those in America, Canada, Mexico, United Kingdom, Australia, New Zealand, Grand Cayman and Puerto Rico. Starting in 1969, Michael was as an on-air announcer with WHJB-AM in Greensburg and moved to WCVI-AM in Connellsville and later to WMBS-AM in Uniontown. He went on to program radio stations in Wheeling, Charleston, Louisville, Los Angeles and Cleveland. He was a general manager in Mobile, AL and Cleveland. He and Doris have owned and operated radio stations in Naples, Key West, Honolulu and Flint, Michigan. Michael founded McVay Media in 1979 which became a full-time avocation in 1984. He has authored several broadcast primers, writes for Radio & Records magazine and contributes to Radio Ink magazine. He has been nominated for Consultant of the Year from Billboard Magazine, and Radio & Records. He has captured the Ohio Media Leader of the Year Award, Broadcaster of the Year from the Cleveland Association of Broadcasters, is an inductee into the Cleveland Broadcasting Hall of Fame and has won the Radio Music Award for Broadcast Consultant of the Year during the RMA™ event in Las Vegas. For an unprecedented three years in a row, he was named the R&R Broadcast Executive of the Year (2006, 2007 and 2008) for Radio & Records magazine. Mike was elected to the board of the Country Radio Broadcasters (CRB) in October 2008. Today McVay Media is a program consultancy serving radio, TV, the Internet and digital media platforms. He also has been president of McVay Syndication (a radio network syndicating several radio programs), is the partner of Listener Driven Radio (a New Media Platform) and co-founder of a digital consulting firm named McVay New Media. With a management and accounting degree, Doris serves as CEO of McVay Media and coordinates the main and satellite office locations.